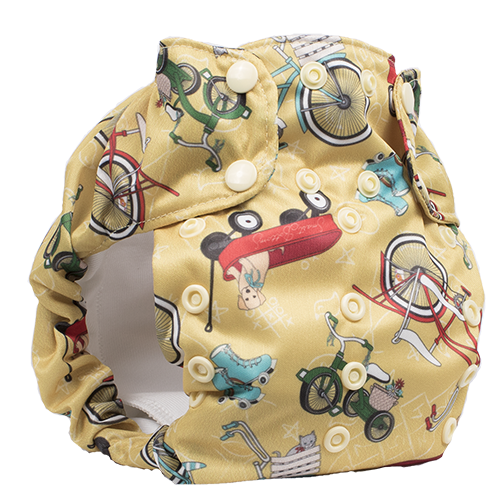 Smart Bottoms Dream Diaper 2.0 is a super trim, one-size hemp/organic cotton diaper designed for babies 8-35lbs. 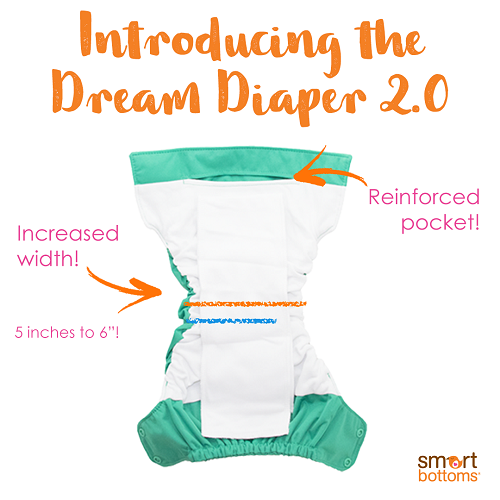 Smart Bottoms Dream Diaper 2.0 - All-In-One! 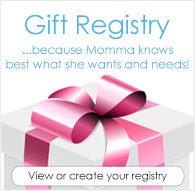 End your search for the perfect all in one diaper! Smart Bottoms Dream Diaper 2.0 has it all. The Dream Diaper is Smart Bottoms first No-Prep, Natural Fiber Diaper. 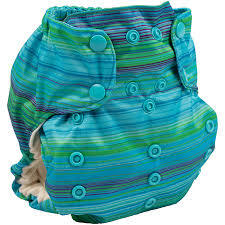 This diaper boasts 30% more absorbency than the 3.1 due to it's Hemp and Organic Cotton fabric. The body of the diaper is made up of 3 layers of Organic Cotton and Hemp jersey and the snap-in, included insert provides an additional 4 layers. The Dream Diaper by Smart Bottoms also features a pocket that allows additional absorbency to be easily added. 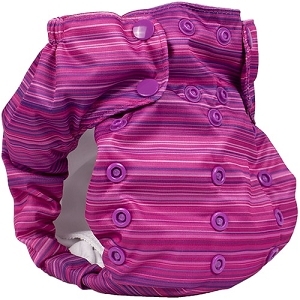 Add the Overnight Dream Diaper Insert (sold separately) for extremely heavy wetters or overnight use. 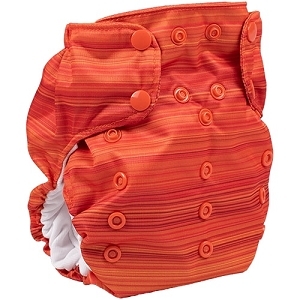 This insert snaps into the diaper in place of the included insert and will double the absorbency of the diaper as well as add a microfleece lining for that stay dry feeling. The NEW Dream 2.0 has some added improvements! 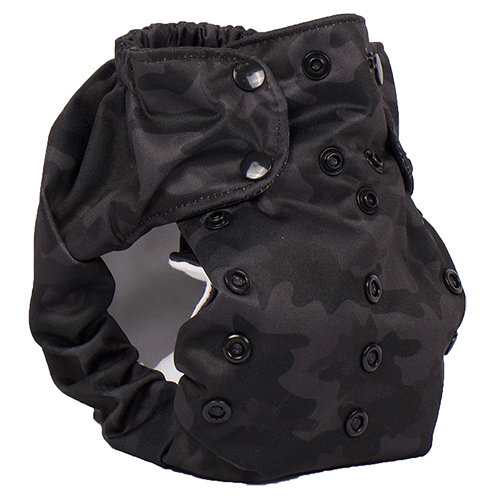 The diaper's pocket has been re-designed to create a clean look while still being generously sized to fit any insert. They have increased the width of this diaper by one inch, starting at the crotch and up through the back of the diaper. 55% hemp/45% organic cotton inner - Soft, stretchy, and absorbent. No prepping needed! Super Absorbent - Snap in insert offers layers of protection. Quick Drying - Innovative design means this diaper will dry in one cycle on warm in most machines. Includes a pocket to add additional absorbency yet minimize dry time. Made in the USA - Smart Bottoms is committed to manufacturing in the United States and promotes fair labor practices. A one size all in one diaper featuring a hemp and organic cotton inner. Love this diaper. Our baby is tall and slim and it fits beautifully. Wish I had tried this before making most of my stash of Thirsties NAIO. I really appreciate having a diaper where I can move the absorbancy. I have a little man and these are great to put the extra folds at the front. I also love that the inserts snap out for easier drying! Brought my first smart bottoms 2.0. I’m really impressed at the print! It’s so adorable! The diaper itself has yet to finish the prepping stage, but I love the option of the pocket so you can accustom the absorbency needs, and I love the feature where you can snap off the insert! So far it’s a 5 stars from me! I love how absorbent this diaper is, but I don't love rolled elastics. The sprinkles print is absolutely adorable too. I was never a big fan of the fit of a smart bottoms diaper, but once I tried the dream diaper I was hooked. I love the way that it fits my son, much better than the 3.1. I even use the overnight inserts at night. I love hat I'm able to use the diaper either during the day or at night. This diaper lasts a long time with just a single insert, and all night with the single insert in the overnight insert for us.